They have been tested for over 100,000 impressions. 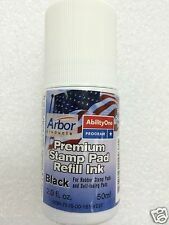 They are easy to use and the easiest to re-ink, with a convenient slide out ink pad. They re-ink with regular rubber stamp ink, no special inks are required, and perform for thousands of stampings between re-inkings. Speed up the usually tedious process of addressing letters with the TRAXX 9011 address stamp. 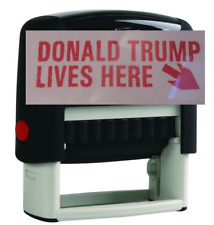 This stamp comes in ideal 50 size, so you know it'll fit your envelopes. The stamp can be customized, so you can use any return address necessary. The stamp is self-inking, which makes it more convenient. This stamp can ink the standard three-line address. It is made from rubber, which means it'll last for thousands of stamps, as long as it is used properly. Although my address hasn't changed, I've been living here so long that my original return address self inking stamp stopped working properly. When I found this product I purchased it immediately. It arrived amazingly fast exactly as I ordered it and I have been happily using it since. This is a fine example of real value! They should change the name to T-Raxx, because this beast gobbles up the competition. That ain't red ink, son, that's the blood of a velociraptor that thought it could make a cheaper, better rubber stamp. This sumbuck roars with delight every time I smear that blood on my fine 50# ivory envelopes. My return address conveys to the recipient, "I'm a nice guy. I have a family. But I will kill you." I like that. I love my new stamp! Instead of an address, I had them make a stamp I could use for endorsing checks for Mobile Deposit. Just the perfect size and works every time. I will buy again! I ordered two of these for our office staff. They are awesome! You get a high quality stamp that is sleek and efficient. It's the perfect size for my hands. Thanks for a high quality produce at a great price! A silly, fun item to have. We ordered several to give as gifts to a couple of our friends. Makes for lots of laughs with our friends of both political parties when they see our stamped $20 bills. Included were extra ink pads, another rubber stamp that can replace the one on the stamper, and miscellaneous small related items. We can all use a few laughs. Merchant, godflesh200272, was outstanding.